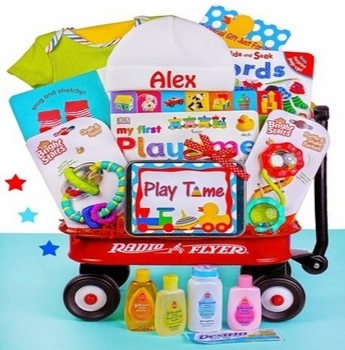 This practical and cute play and learn wagon features educational board books and useful baby basics. The super soft fleece baby hat is embroidered with the baby's name on it for an especially thoughtful gift. The authentic mini Radio Flyer wagon will be a perfect addition to the nursery for pulling toys and such around the house. I'm glad I found this gift, I had been trying to find something with an emphasis on baby learning since the baby was already a few weeks old and the parents had received many outfits, blankets and such. This gift has a lot of good interactive things for a new baby. If I could have exchanged the lotions for more educational toys, that would have made it even better but they did like the little hat embroidered with the name quite a bit so I'm glad I chose that option.